This past Saturday, I had the honor of moderating the panel for Womanthology at c2e2 in Chicago with a bunch of awesome women. The program listed 7 of us: me (you know…Jessica Daniel), Candice Reilly, Lauren Burke, Raven Moore, Stephanie Hans, Katie Shanahan & Jean Kang. Unfortunately, Stephanie couldn’t make it. Some of our Chicago food did not agree with her (I know it wasn’t the pizza. In fact, that might have cured her.) and she was greatly missed, but at the last minute, we had two additions to the panel that made it that much more awesome…Gail Simone and Janet Lee joined us. Surprise panelists much to the delight of our modest yet awesome crowd. The questions were overall great questions from the audience that really added to the discussion and led to further conversation after the panel about the direction of the industry and the desire for more women-centric comics. One of the things I found quite interesting was the discussion on creator owned comics and the uprising trend toward self-publishing. Besides discussing this at the panel, I had this conversation multiple times over the very long, tiring, crazy, fun weekend at C2E2. I do a lot of lurking about when it comes to this topic as a writer. As I get more and more work out there and bit by bit, more recognition, it is something I research extensively. I am really not sure what I will do when it comes time to get Nyctalopia to the masses, but I do know that retaining rights to my own work is important. 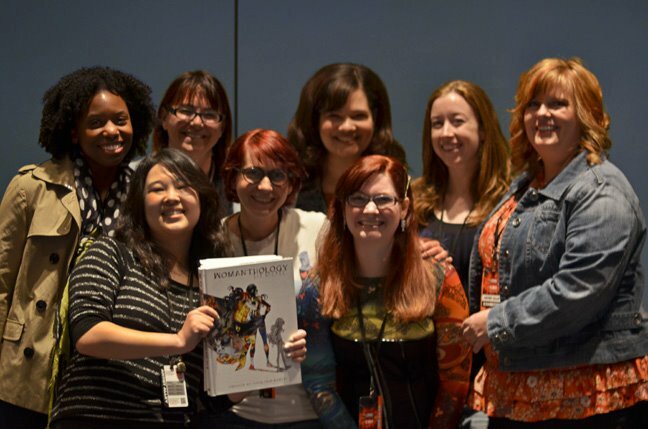 If there is one thing this project has done for me, it is get me to come out of my shell more, step back from the keyboard every once in a while and get out and actually meet some of these terrific women who all had a part to play in the massive tome of fantastic-ness that is Womanthology. As I continue to work toward my goals, I am learning more and more how important it is to have a network of not just people who might just click on a link you share and actually take the time to look at your stuff, but a network of people who you can consider friends and who will support you and share enthusiasm about each other’s projects. The comics community is really a great community of people who sincerely want to help each other succeed. If anyone has any thoughts about the panel or the topics we covered, I would love to hear them! I am still much to exhausted from the weekend to cover everything from C2E2, so in the next couple of days I will get at least one more post up about Sunday-when I took my monsters with me and possibly one about networking on Friday.